I have always related some of my past memories to objects, and most of the time they happen to be shoes. I’m not a shoe addict, I don’t have piles of shoe boxes in my house, but I must admit they exert a huge fascination, maybe because I’ve rarely worn shoes I actually liked. Since I was a teenager, I have always had issues in finding nice shoes in my size (a EUR 35), for this reason I soon turned to Converse All Star Chuck Taylor Hi Top sneakers and started to wear them all the time (yes, in winter, too, with a thick pair of wool socks) . I have owned several of them (my first pair was blue, then red, cream, pink and purple) and I cannot have enough of them, because they are super-comfortable and cute. Some years ago I discovered Melissa plastic shoes  and it was love at first sight: most of their models  are lovely, colourful and incredibly comfortable. For this reason, Melissa shoes have soon become a must in my shoe rack. I am not surprised more and more celebrities are discovering the irresistible charm of plastic shoes! Beth Ditto, frontwoman of The Gossip, is the biggest fan of Melissa shoes. She wears them all the time and has quite a collection of them. She ofter wears Ultragirl flats, a basic ballerina flat with a tiny peep-toe on the front. She owns them in black, which she paired with an all-black ensemble – leggings and coat. Don’t you love her red-dyed hair? She also has them in red, lovely. She wore them in December 2008 with a gorgeous black dress with white collar, so reminiscent of Courtney Love and Kat Bjelland’s good-girl dresses but also of the infamous Yves Saint Laurent dress Catherine Deneuve wore in the closing scene of Belle de Jour by Luis Bunuel. Her pixie haircut and make-up are flawless, love them! Back in March 2009, she attended several fashion show in Paris. She was spotted leaving the Chanel show wearing a black dress, a printed coat and Ultragirl II flocked flats in grey. These have been designed by Vivienne Westwood (see the globe on the side of the shoe), one of the most important designers who collaborate with Melissa. A different version of the same style has been recently spotted on Carrie Underwood, too: while shopping in Beverly Hills and hiding from paparazzi, she wore Ultragirl Night Sky flats in grey, pairing them to a casual ensemble and a Stella McCartney vynil tote. These glittering shoes have been designed by J. Maskrey. Beth must be a Vivienne Westwood fan, because most of the Melissa shoes she has worn have been designed by Westwood. In March 2009 she attended Jean-Charles de Castelbajac’s fashion show in Paris wearing a Jeremy Scott bodycon dress and Melissa mary-janes in white. She opted for the fuchsia version of the same style when she attended Jean-Paul Gaultier fashion show, and wore it with a turquoise bodycon dress and a black cardi. The same style in black is part of Katie Holmes’ shoe rack: the American actress wore these mary-janes while filming The Extra Man in New York in March 2009. This is one of my favourite styles: I’ve looked for the black version everywhere, but I found it for sale only in white (and I hate white shoes). In July 2009 Beth launched a collection she designed for Evans with a big party in London. She wore an interesting outfit (dominoes-printed bodycon dress and leggings) and Vivienne Westwood for Melissa three-strap elevated pumps in black. This is one of my favourite styles ever. Last week, at the Grammy Awards, the same style – but in plum – were spotted on Hayley Williams, Paramore‘s frontwoman. She paired them to a sleeveless embellished dress and to a gorgeous hairstyle. I love her orange-dyed hair. I own the flat version of the same style and I totally love it. Another fan of Melissa shoes is Katy Perry. Melissa shoes are perfect to complete her colourful, flirty and funny style. In 2009 she was spotted shopping in Beverly Hills with a pair of Lady Dragon slingbacks on. She opted for the baby blue version with red heart on it, and also wore a Jeremy Scott for Adidas dress. This is one of Melissa’s most successful styles, designed by Vivienne Westwood. She also own the same style in another colour combo – salmon with black heart. She wore these slingbacks during a promotion tour in New York, and paired them with black leggings, a simple white tee and a floral jacket. Pamela Anderson has never been famous for her good taste and refined style, but there must something else which convinced Vivienne Westwood in picking her as her muse and protagonist of her latest advertising campaigns. This means Pamela has free access to Melissa shoes, lucky girl! In this pic she was wearing yellow and black shorts and a lavender tee, plus Lady Dragon slingbacks in salmon with black heart. It looks like she’s pointing at her lovely shoes, isn’t it? In Westwood’s fall/winter 2009 advertising campaign she posed for Juergen Teller with the designer and Andreas Kronthaler. In this pic she wore Lady Dragon slingbacks in black with red wax seal. I love the wax seal ornament! In another pic of the same campaign, she wore Lady Dragon II slingblacks in black with tortoiseshell bow. I usually don’t wear high-heeled shoes but I’d love to wear these. Dita Von Teese usually wears Christian Louboutin towering heels, but in October 2009 she wore these cute Ultragirl II flats in black with tortoiseshell bow. I think they perfectly match Dita’s flawless outfit. Another successful Melissa style is Campana, designed by the Brazilian designers Fernando and Humberto Campana. These flats look like a messy ball of thread, adorable! Just a few days ago, Anne Hathaway wore them in grey during a shopping spree in Beverly Hills. Jessica Biel opted for the gold pink version of the same flats, wearing them with a comfortable jumpsuit and a simple white tank top. The last – but not least, I hope – celebrity who wore Melissa Flats is Vanessa Minnillo. 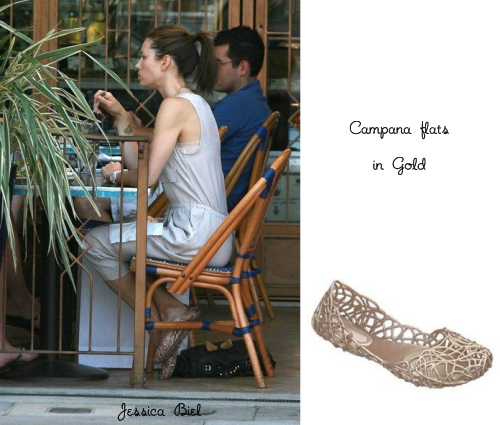 She opted for a different version of Campana flats – the Campana Zig Zag – in gold. I don’t like Minnillo’s style, but these flats are gorgeous. As for me, I own four pairs of Melissa shoes. I love them all, because they’re comfortable and have a lovely shape. I usually wear them with socks because I don’t like the feeling of plastic on naked feet. I wore them without socks just to take these pics. I bought the first pair – Aranha flocked sandals in blue, designed by Isabela Capeto – in 2007. This is the only pair I can actually wear without socks, because the plastic doesn’t become sticky with the heat of your feet. 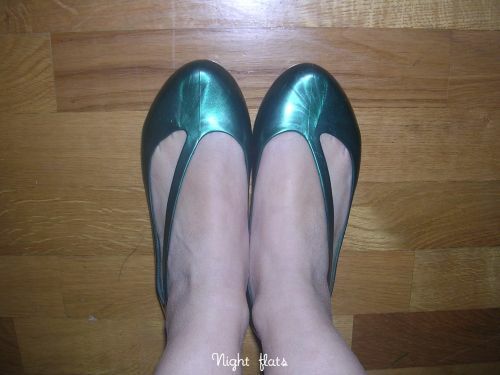 I bought the second pair – Night flats in green – in 2008. These are made of shiny plastic, and I wear them all the time, when I’m at home. 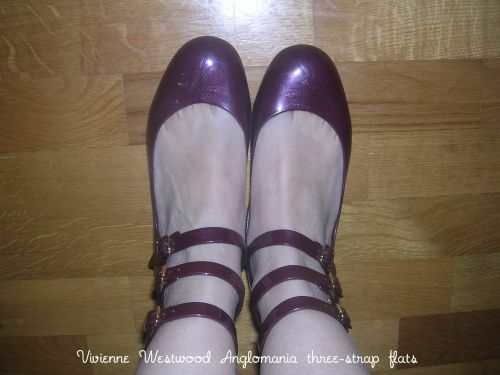 I bought the third pair – Vivienne Westwood Anglomania three-strap flats in plum – in 2009. I love them and I think they are among the most beautiful shoes I’ve ever owned. At first I wanted them in red, but I couldn’t find them in my size (no surprise), so I opted for plum, a very nice colour. I’ve just received the fourth pair from Yoox and I’m so excited! These are the Severine flocked flats by Thais Flosso. I fell in love with them the first moment I saw them, because they are the Melissa version of the iconic Roger Vivier buckle flats seen on Catherine Deneuve in Belle de Jour (again a reference to this film! Deneuve’s character’s name was Severine, hence the name of this style). I could never afford Roger Vivier flats, but these are eco-friendly and more comfortable, I guess. Have you ever tried Melissa shoes? Do you own them or do you think plastic is not a suitable material for shoes? During my pregnancy I never wore them, because of the strings, so I wore another pair of sneakers (Onitsuka Tigers in yellow with purple stripes and black details) all the time. All the shoes are made of recycled plastic and 99.9% of the waste and water used in the production process is recycled too. Apart from this important aspect, what I like about them is that they are relatively cheap and that they are designed by world-known artists, such as Zaha Hadid, Karim Rashid, Isabela Capeto, Vivienne Westwood, Judy Blame, Fernando and Humberto Campana, J. Maskrey, Edson Matsuo and Alexandre Herchcovitch. I have tried some wedges and they are not easy to walk in; I’ve never tried Melissa high-heeled shoes and I think I will never do it, because I’m not a high-heel-kind-of-girl. Oh I love the three-strap flats! They remind me of the wonderful three straps by Chloe. But I am surprised to read that you find these shoes very comfortable. I own a pair of plastic flats (an imitation of the jelly mouse by Marc Jacobs), but they hurt my feet terribly. I think it depends on the shape of the shoes (and to be honest, I wouldn’t be surprised if even the original Jellies by Marc Jacobs hurt your feet, because his shoes are famous for being uncomfortable) and on the quality of the plastic. I don’t like wearing uncomfortable shoes, because I can’t stand the pain of wearing something which actually hurt my feet; for this reason, I can assure you Melissa shoes (at least the ones I own) are as light as feathers. I love the black ones with the buckle, they have such a cute toe shape!! I usually hate plastic, but Melissa rubber smells so good! and it doesn’t really feel sticky. I have these flat sandals, bought in Milano (fun seaside shoes), and the Westwood black mary-jane, found online. I’d like to have more, as they’re really cute, but I have a sizing problem: the brazilian 33/34 (is this what you ‘ve got?) is a tiny bit small for me, and the upper size definitely too big. also, I’d stick to flats: the mary-janes are lovely, but not so well made as a «real» shoe, in my opinion. I like the flat sandals you own! ciao! vorrei comprarne un paio anche io…ma calzano il numero giusto? In base alla mia esperienza, il 35/36 calza un 35, ma penso dipenda anche dai modelli. Due delle scarpe Melissa che possiedo le ho comprate in negozio, dove ho potuto provare anche il numero successivo, e capire quale misura faceva al mio caso. Ti consiglio, quindi, se hai un negozio che vende scarpe Melissa nella tua zona, di provarne prima un paio, poi magari le compri on-line ma almeno sai quale è la misura giusta per te. Do you have difficulties in finding shoes you actually like in your size? My favourites are the plain Ultragirl flats, either in shiny black or red- i’ve always liked that strange peep toe, and have been thinking of getting them- but the fact they’re entirely made of plastic puts me off, as i have some trouble finding shoes that don’t hurt my feet and like you, i cannot stand uncomfortable shoes. i really really like your Night flats, and also i too would stick to flats- that rubber heel looks so wobbly to me!! I have mixed feelings about the Vivienne Westwood Lady Dragon shoes- i like the ones with the bow, but quite dislike the ones with the heart. Also, i suppose i’ve always been skeptical about the craze that surrounded the ‘heart’ ones: I’ve always wondered whether so many fashionistas (or fashion victims) would actually wear them, had they not been designed by Vivienne Westwood. Sono così contenta di aver visto questo post!!! Mi piacciono un sacco le Lady Dragon, sia quelle con il cuore che quelle con la sfera sulla punta ma sono tanto indecisa… ovviamente a causa del materiale. Molte mie blog-amiche mi hanno detto che sia le ballerine sia le mary jane sono comode. Ma le Lady Dragon hanno 10 cm di tacco e mi chiedo: come si porteranno delle scarpe di gomma con 10 cm di tacco?! Tu hai mai provato quelle con i tacchi? Ma soprattutto: fanno sudare i piedi e poi diventano mortalmente scivolose o sono confortevoli anche con il caldo??? Il tuo blog è sempre una risorsa preziosa! Sulla comodità non c’è nulla da dire, perchè le scarpe Melissa sono stra-comode. Non ho mai provato modelli con i tacchi perchè ho le tue stesse perplessità, ma c’è un’alta probabilità siano comodi pure quelli. Sulla questione legata al caldo, posso darti la mia opinione. Alcuni modelli (tipo il mio Aranha) sono realizzati in una plastica che non diventa eccessivamente scivolosa, quindi portarli in estate non è un problema; altri (come Night), invece, diventano scivolosi, quindi evito di portarli in piena estate. i have the three strap flats in black, and ever since i saw them in the heeled version i’ve been wanting those as well. they’re so ridiculously comfortable! Even if I’ve never tried Melissa heeled styles, I can confirm their flats are incredibly comfortable! I’ve even ditched my collection of Converse All Star hi tops for wearing Melissa shoes all the time! Alla fine ho preso le 3-strap eleveted mary jane in verde scuro e sono comodissime! Ottima scelta! Buono a sapersi che sono comode: la prossima volta ne proverò un paio! Hi, I do PR for Melissa in Brazil and I was wondering where did you get those images, we’re very interested in buying them! Could you please send me your contact via e-mail? io vorrei comprare le ballerine 3 straps ma le ho trovate solo su yoox… e c’è solo il 37!!! qualcuno sa come calzano? io generalmente per le ballerine prendo un 37… talvolta anche il 36! Nasty. Velcro straps? I hate crocs too, and this is no better. Noooo! The Melissa shoes I own don’t have velcro straps. Ok, you might not like the feel of plastic, but I can assure you they’re gorgeous and not comparable to Crocs in any way. I’m absolutely passionate about melissa shoes. So that’s why I decided to sell melisa shoes worldwide cheaper than stores.